A family member has identified the victims who were killed when a small plane crashed in a neighborhood on Detroit's east side Sunday night. The NTSB held a press conference on Monday afternoon. Watch it below. According to the family member, the two who were killed were 54-year-old Greg Boaz and his wife, 48-year-old Julie. Greg's son, 17-year-old Peyton, was able to escape from the crash but is in critical condition at a Detroit hospital. 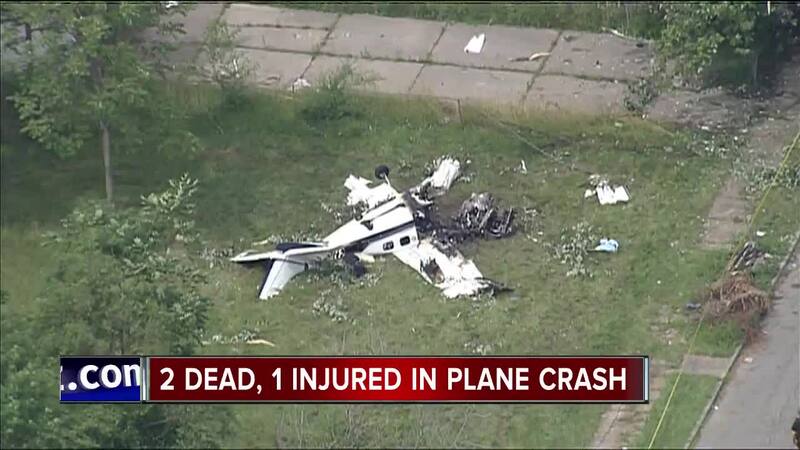 The crash happened near Detroit City Airport just after 8 p.m. The Cessna 210 left Arkansas heading for Detroit at 4:43 p.m. and was expected to arrive at 7:57 p.m.
An FAA spokesperson told 7 Action News that the pilot reported a landing gear problem and low fuel shortly before the crash. Both the FAA and the NTSB are on scene investigating. The plane was fully engulfed in flames when first responders arrived on scene. According to the NTSB, the plane flew by the tower after reporting a landing gear issue, and the tower confirmed that the landing gear was not down. The pilot then asked for an area to land on the airport property and that was the last communication between air traffic control and the pilot. Danny Boaz, Greg's cousin, tells 7 Action News that Greg has been flying for years, but hadn't flown in the last decade. Danny said Greg bought the plane last week and that they were heading to Detroit for Greg's daughter's cheer competition. "I was asking if he flies anymore, he said 'no.'" Danny said. "He was thinking about getting back into it. I really believe that the conversation kind of peaked his interest in flying again." According to the NTSB, the pilot has reported 650 hours of flight time, which was self-reported during a medical examination in October of 2017. Records show that he purchased the plane in April. A witness helped save Peyton from the wreckage, using an axe to put a hole in the plane which Peyton was able to escape from. Danny told us that Peyton has third-degree burns and is still in the hospital. The NTSB expects to have a preliminary report ready by the end of this week or early next week, but that report won't have a cause of the accident or conclusions from the investigation. According to the investigator on scene, they won't have a final report ready for at least a year. Also on scene or three FAA investigators, and the plan will be to continue their investigation before moving the airplane to a secure area on the airport property on Monday afternoon to continue their investigation.